Korbel Brut is America's favorite bottle-fermented champagne. It is used to celebrate more weddings, anniversaries, and New Years celebrations than any other quality champagne. 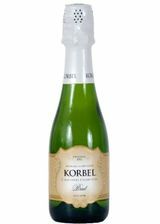 Korbel Brut is light and crisp, with spicy fruit flavors. It is finished with a 1% dosage for a balanced medium-dry finish. Korbel Brut is perfect for every celebration and many meals. Try it with chicken dishes, oriental foods, especially those using lemon grass or mild curries. Korbel Brut is also great served with many fruits and milder cheeses. Earthy and doughy aromas lead to subtle, crisp apple and bright lemon flavors in this very good, go-to wine that has lasting fine-beaded bubbles. It tastes dry and refreshing and feels crisp and lively on the palate.